Conversational Annotation explored the interactional dynamics and potential of ‘Social TV’ audiences. 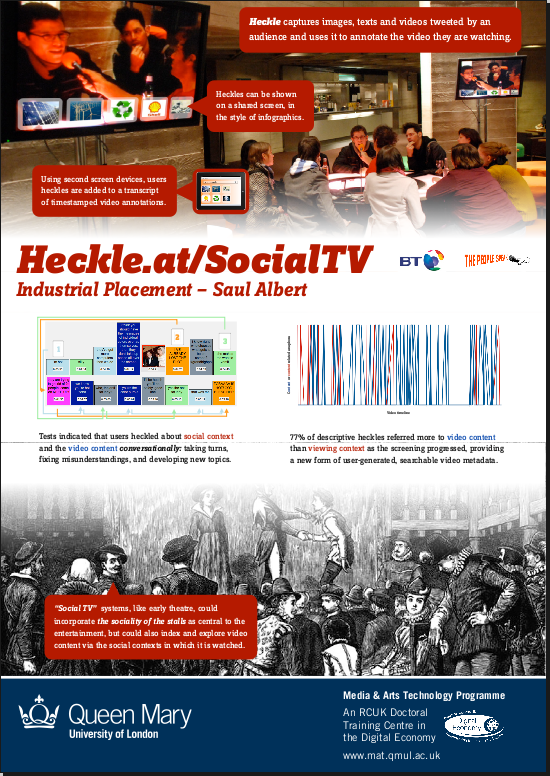 As part of an industrial placement with BT I worked with The People Speak to develop Heckle, a twitter-like web-service that captures the comments, asides, and discussion generated by an audience to annotate video content. 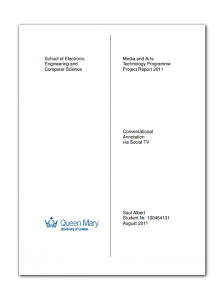 Analysis of of these mediated conversations revealed the degree to which people’s comments related to the TV content (characters, plot developments and production entities), and to what extent they related to the organisation of activity in the local context (crisps, drinks, sofa arrangements etc. ), and looked for differences in frequency, peaks and other pragmatic detail evident in the data indicating to what extent this could function as media metadata. A closer qualitative approach assessed the its amenability of this data to conversation analysis, looking for evidence of turn-taking sequences, and various forms of conversational repair. ‘Conversationality’ in these empirical terms interrogated the technology and situations of ‘Social TV’, providing a critical view of the over-applied term ‘social media’ often used to refer to these forms of mediated communication. There’s a working copy of the Msc thesis based on this research available here. M.Sc. project co-supervised by Pat Healey at Queen Mary University of London and Andy Gower at BT. Thanks to all the participants in the Dr. Who screenings, Richard Kelly, Toby Harris, and The People Speak.